ME64 – How do mangrove trees reduce thermal stress and provide environmental buffering for fish in a Caribbean mangrove forest? 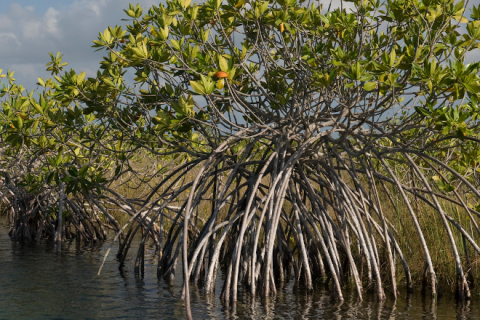 Mangrove forests are well known for their functional traits, particularly the nursery function enhanced by the complexity of Rhizophora prop roots. 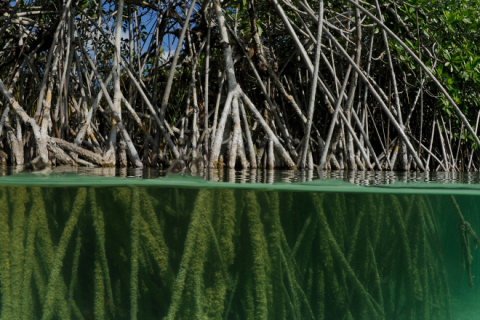 A less understood functional trait is how mangrove trees may benefit biodiversity mechanisms through environmental buffering and how such traits may influence fish behaviour. Rhizophora mangle trees will be investigated for their biodiversity function of reducing thermal stress for the mosquitofish, Gambusia affinis. Diurnal distributions of fish populations between open channels and shaded tree areas will be investigated. During the morning, when temperatures are cooler, and in the afternoons when temperatures are at their most extreme, fish behaviour will be studied. This study will also investigate the critical point when fish populations switch from being exposed in the channels to moving in areas of more shade, which offer reduced thermal stresses to the fish. Environmental variables will be measured, temperature and salinity, and then correlated to patterns of fish movements within the mangroves. Size distributions of fish populations will also be made to determine if the fish are mature adults, immature or juveniles. 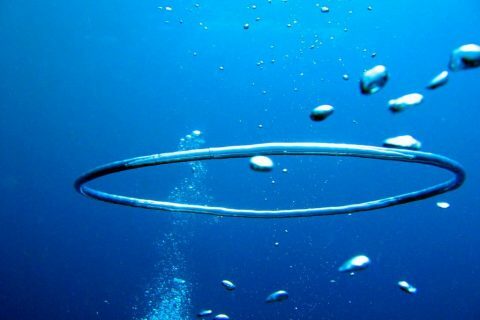 If the fish are immature, then potentially, the thermal stresses caused by the excessive channel temperatures may impose serious developmental impacts that would be reduced by occupying the shaded tree areas. Thus, the mangrove tree may provide a little-known refuge of environmental buffering for juvenile and adult fish, which would otherwise be exposed to lethal thermal stress. 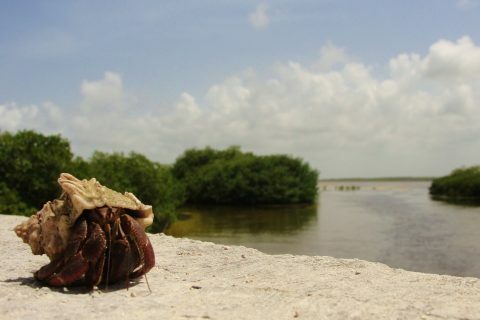 Akumal is a small coastal town located approximately 2 hours’ drive south from the major tourist destination of Cancun. The name Akumal literally means “home of the turtles” in Mayan. It earned this name due to the numerous turtle nesting sites along the beaches and the permanent presence of juvenile turtles in the seagrasses just off shore. Prior to established tourism in the Yucatan, the only real source of income was from fishing. The reefs were so heavily overfished that the entire ecosystem almost collapsed. Moreover, sea turtles and their eggs were a major food source rather than an attraction to be admired, resulting in a serious decline in the turtle population. 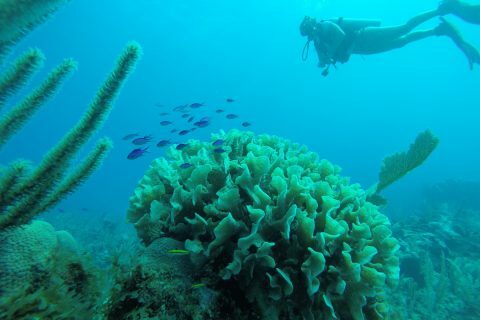 In an attempt to save the reef ecosystem and provide alternative income for local people, dive and snorkel based tourism was actively encouraged by the Mexican government. Tourism in the area has steadily increased over the last 20 years, but now it has brought problems of its own. More hotels are being built to accommodate tourists leading to loss of important nesting habitat for turtles, loss of mangrove habitat that cleans water and prevents sediment from washing onto the reef, and too many people snorkelling with turtles. 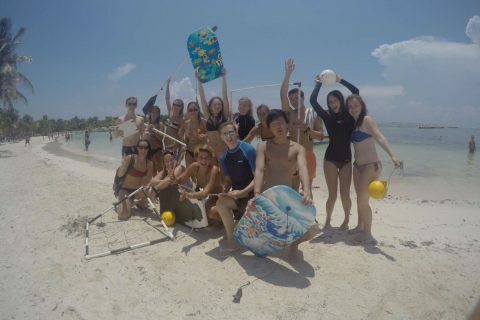 At the marine site, the research is focussed on assessing the efficacy of the newly formed Akumal marine protected area on the abundance and health of seagrasses and the impact of snorkel tours on the abundance, health and behaviour of sea turtles. The new protected area also provides the opportunity for recovery of the coral reefs, but as natural coral recovery rates are so slow, we are assisting the process by attaching coral fragments to artificial reefs composed of different substrates of varying structural complexity in order to assess the best methods for coral reef restoration in the region. Combined with mapping and monitoring of the existing reefs we are able to determine the positive impact of the new protected area on the coral reef ecosystem. 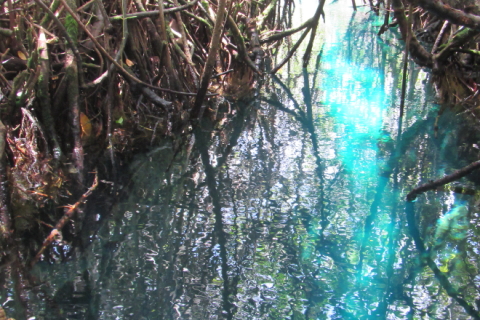 Another aim of the Akumal project is to monitor the impact of mangrove degradation on the adjacent reefs and to investigate the ecology of the unique mangroves surrounding sink holes (cenotes) connected to the underground river system that runs throughout the Yucatan Peninsula. Learn mangrove biodiversity survey methodologies. Cost of internal travel to and from the start and end point of the expedition, plus any hotels you might require. This costs around £177 or $257 on average. Extra nights’ accommodation in Cancun costs around £61 or $88. Set away from the main town of Akumal, students stay in purpose built accommodation set in a pleasant forested area. They will sleep in bunk beds with dormitories spread across three floors. Rooms are shared with up to 14 people. Each dormitory has its own set of showers and toilets. There is a communal eating area and lecture areas on each floor. From here there is a ten minute drive to and from the beach each day. The dive training centre located at the beach.